We’ve officially made it through Winter and have jumped right into the Spring market in Greater Victoria (ie ‘listing season’). There were a total of 1,284 properties listed in March of 2019, compared to 757 properties listed in February of 2019. There is typically a notable difference between the start of the year and the first of the Spring market, when sellers feel that their property looks best, and buyers want to be outside shopping since the weather is warmer and much more inviting! Overall in Greater Victoria Real Estate, we saw a total of 640 properties sell in March of 2019 (only a 7% decrease from March of 2018 but a 52% increase compared to last month). It’s safe to say that the Spring real estate market has sprung into action. 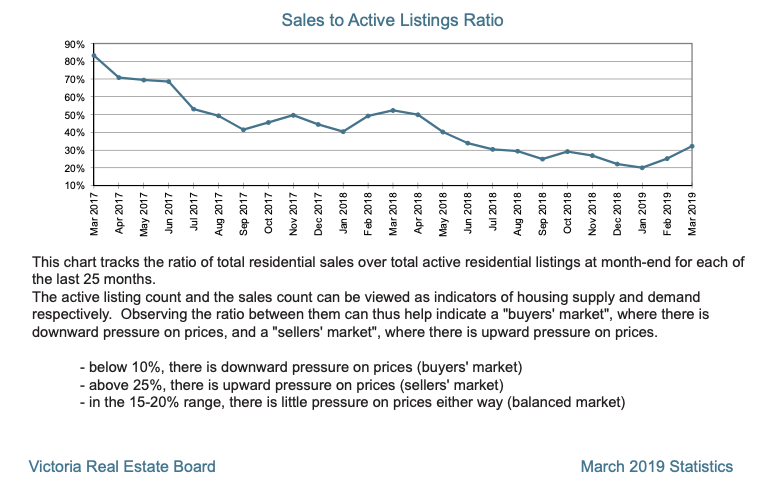 We started to see the ‘Sales to Active Listings Ratio’ decline at the end of 2018, showing signs of moving past a balanced market and into a buyers’ market. However, since January there has been a continued upward pressure on prices, bringing us back into a sellers’ market after March 2019. The Victoria Real Estate March stats for condos show 196 sales this year, down 7% from 211 in March 2019, however up from last month by 52%. Our office is continuing to see multiple offers & quick sales on condos that are in desirable areas and price points. This year we see an increased inventory with 505 active condo listings at the end of the month, compared to 311 at the end of March 2018. With increased inventory, there may be more choice and more time for buyers to make informed decisions in their buying process. “Like in February, REALTORS® have been busy showing properties and discussing strategy with buyers and sellers, while the sales numbers themselves continue to be relatively flat when compared with last year. These market conditions are not a surprise. Consumers continue to adjust to the B20 mortgage qualification rules and the long-term, low inventory of homes. The good news is we have seen a month-over-month increase of active listings on the market – though we remain well under the ten-year average of 3,403.” says Victoria Real Estate Board President Cheryl Woolley. To read the full Victoria Real Estate March statistics report from the Victoria Real Estate Board, check it out here.